My kids and I have had summer pool passes since they were toddlers. It’s a lot of fun, but getting kids to the pool is HARD. 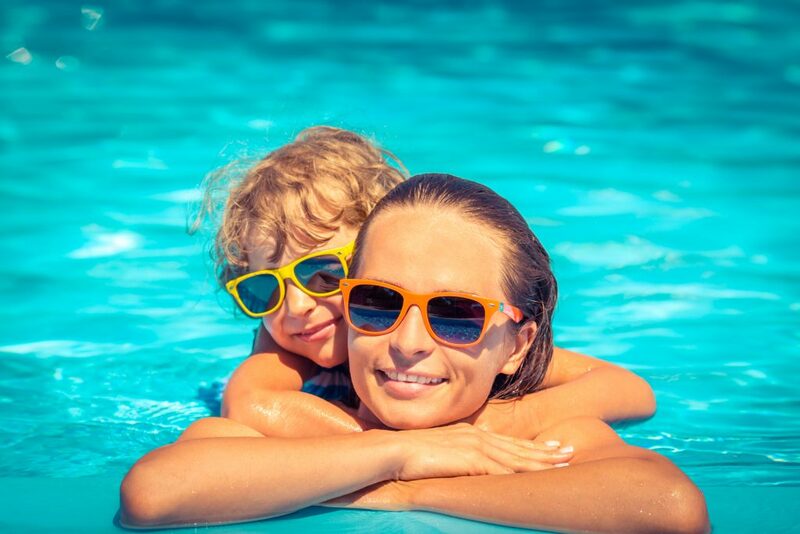 Have you ever tried to carry 4 towels, snacks & drinks for the day, swim goggles, AND flip-flops? Do you ever see those moms who have it all together at the pool? They’re dressed in a sunhat and flowing cover-up dress and carrying one of those rectangular totes full of healthy snacks. I’m there giving the put-together moms the suspicious side-eye behind my Dollar Store sunglasses. Meanwhile, my pretzels are getting crushed under the towels in my Target bag. If you figure out how to make a trip to the pool with kids look effortless, please let me know! In the meantime, I was wondering about those handy utility tote bags that I spotted around the pool. Most of those totes I saw are Thirty-One Gifts Large Utility Totes. But, like many MLM products, their prices are absurd. Thankfully, it turns out there are plenty of less expensive alternatives! What Are Thirty-One Gifts Utility Totes? Thirty-One Gifts (aka 31 Gifts) is a multi-level marketing company that sells mostly bags. They mostly sell through home sales parties, and I’ve written before about why I think you should avoid home sales parties. Should I Become a Thirty One Gifts Consultant? Many people considering joining Thirty-One Gifts just to get discounted prices on the products. I think shopping around for cheaper alternatives is the better way to go. If you’re considering becoming a Thirty-One Gifts consultant, please check out my post about why joining an MLM will not solve your financial problems first. 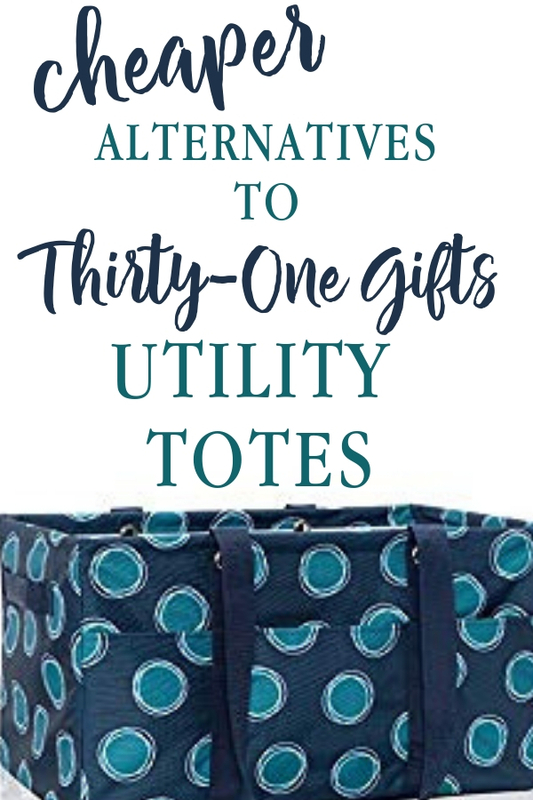 Thirty-One offers two varieties of the utility tote: regular and deluxe. I believe these accessories just make an already over-priced bag, even more absurdly priced. If you bought a regular tote, a top, an insert, and a pocket, you’d be spending $90 for a polyester tote bag! That’s just crazy! 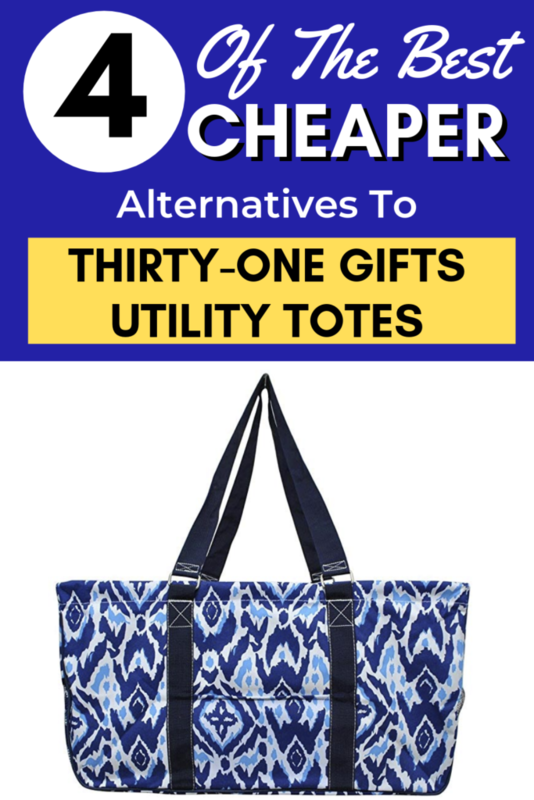 There are MANY cheaper alternatives to the Thirty-One Gifts Large Utility Totes. In fact, I’ve heard that you can get a Mainstays brand tote in the laundry aisle of Walmart for $9.77 that has the features of the deluxe. Unfortunately, I don’t have a link because it’s an in-store only item. Check it out if you’re in Walmart sometime, though. Thankfully, there are also a number of great alternatives on Amazon. I have checked all of these listings on Fake Spot to ensure that the reviews are real, not fake. Some people might call these totes Thirty-One Utility Tote dupes or knock-offs, but they are just other brands of a similar tote bag concept. The N. Gil All Purpose Open Top 23″ Classic Extra Large Utility Tote is most comparable to the Thirty-One Deluxe Utility Tote. The main difference is that the N. Gil bag doesn’t have side handles, but it does have a wire frame that makes it stand up when empty. Reviewers mentioned that the ability to stand up when empty made this tote better than the Thirty-One version. The MDM Large Utility Tote Bag has been touted as being higher quality than the Thirty-One Gifts totes. It is most similar to the regular Thirty-One Large Utility Tote, but with an additional feature of a rigid bottom. Close in price to the Thirty-One regular Large Utility Tote, but for higher quality. Less expensive than the Thirty-One deluxe tote. The AFI Wireframe All Purpose Large Utility Bag is similar to the regular Thirty-One Large Utility Tote, except for one important difference. It has a collapsible wire frame that holds the sides up, even when empty. This makes it more comparable to a regular tote plus the stand tall insert. Priced around half the price of what a Thirty-One tote plus the insert would cost. Cheaper Utility Totes: What Did I Choose? While I didn’t have the money to buy a bag right away, I put the MDM Utility tote on my Christmas list. I got it as a gift and I LOVE it. I think it’s similar or higher quality than the 31 bags I’ve seen. I didn’t figure out the secrets to being the put-together pool mom, but at least my pretzels won’t get crushed! If you enjoyed this post, you might like to read some of my other cheaper alternatives posts to save even more money! Have You Tried Any Thirty-One Gifts Dupes? Have you tried any of these utility tote bags? I’ve love to hear your experiences in the comments below! Can you honestly say this about stuff you buy from a retail stores or online at EBay? I would love to know what you think of them. where can I buy the older versions of the page utility totes for carry casseroles etc to and from . I need one that stays open. I am not sure. You don’t mean the totes like the ones in this post?